^ 1.0 1.1 1.2 1.3 民國八十年颱風調查報告. 交通部中央氣象局. [2015-05-15]. ^ 2.0 2.1 2.2 2.3 2.4 2.5 日本氣象廳1990至1999年度　熱帶氣旋最佳路徑報告 (TXT). 日本東京: 日本氣象廳. 1992-01-04 [2014-07-30]. ^ 3.0 3.1 3.2 3.3 3.4 皇家香港天文台1991年度熱帶氣旋報告 (PDF). 皇家香港天文台. 1991 [2011-12-18]. ^ 美國國家颶風中心術語表. 美國國家颶風中心. 2013-03-25 [2014-06-15]. （原始内容存档于2014-06-01）. 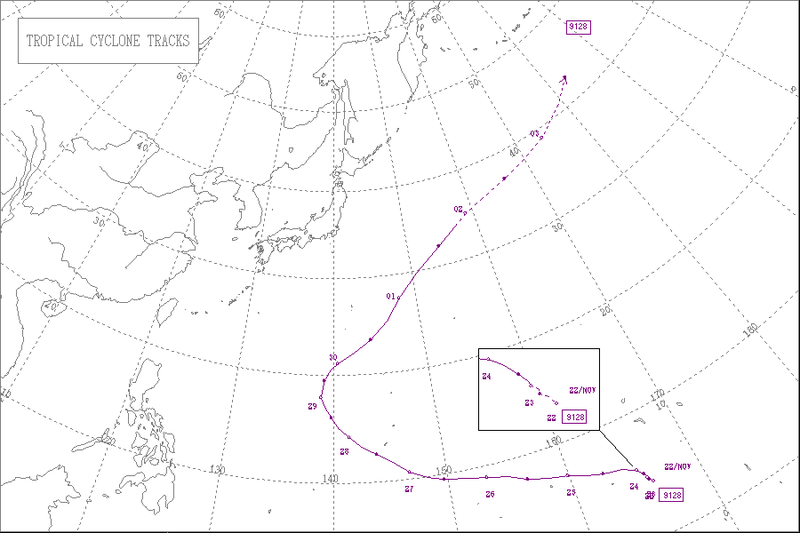 ^ 1991 Super Typhoon Yuri (PDF). 關島: 聯合颱風警報中心: 140–45. 1991 [2007-05-18]. （原始内容 (PDF)存档于2011-06-07）. ^ 7.0 7.1 7.2 7.3 7.4 Rudolph, Dieter K.; Guard, Charles P. 1991 Annual Tropical Cyclone Report (PDF). 關島: 聯合颱風警報中心: 140–45. 1991 [2014-07-27]. ^ Guam still recovering from Yuri. The Rock Mountain News. 1991 [2011-12-28]. ^ BREAKINGNEWS:TYPHOON YURI PASSES GUAM. The Eugene-Register Guard. 1991. ^ Typhoon Yuri passes Guam. Deseret News. November 28, 1991 [December 28, 2011]. ^ YURI PASSES GUAM The Daily News. 1991年11月. 檢索於 2011-12-28.